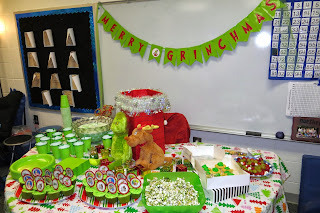 Our 3rd Grade does a Grinch Christmas Party. It was so fun to see all the kids dressed as Who's with crazy hair and bright colors! We also had all-green Grinch food and Grinch crafts and games. The kids even did an awesome reading of How the Grinch Stole Christmas at the end of the party! We had a great time! Here is our set-up. I made a banner with my Silhouette and the "Grinched" font. We had green Grinch punch, green popcorn, green cookies, green grape Grinches, and Grinch cupcakes! 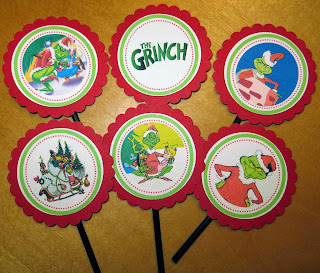 I used my present toss game chimney (details HERE) and a stuffed Grinch & Max as our centerpiece. 2) The Jingle Bell Shake. This is one of my favorite games just for the laughs and pictures! 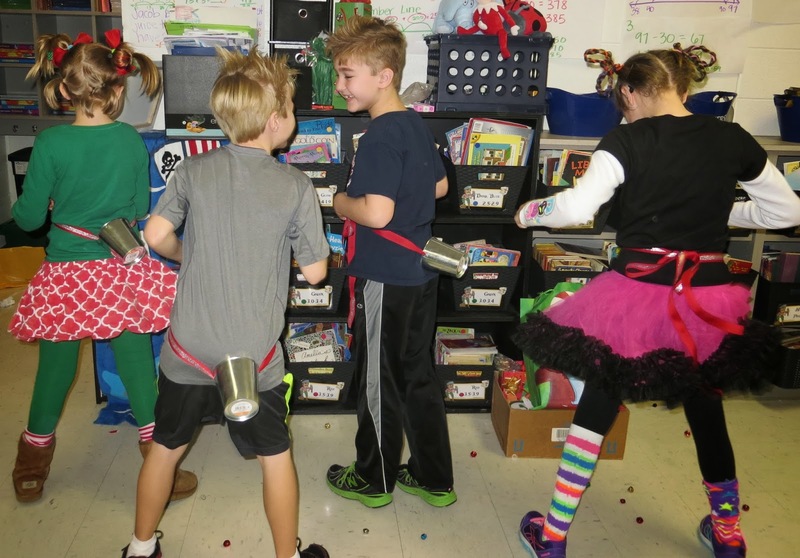 Tie a small bucket around waist, fill bucket with jingle bells, and shake until they all fall out! 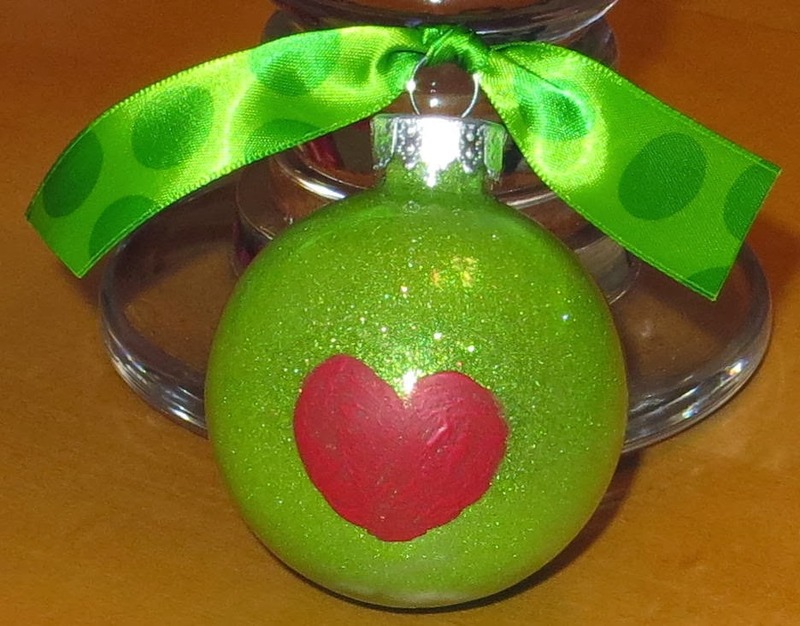 3) Grinch heart ornament. I used THESE instructions from The Ornament Girl to make my lime green glitter ornaments - except I used plastic ornaments. Then I tied a ribbon on top. At the party, we wrote the kids' name and the year on each ornament and the kids used their thumbprints and red acrylic paint to make a Grinch heart on the ornament. (Or, you can have the kids draw on Grinch faces with paint pens). Cut black cardstock into 9.5 x 1" strips. Get lime green pipe cleaners and cotton balls. 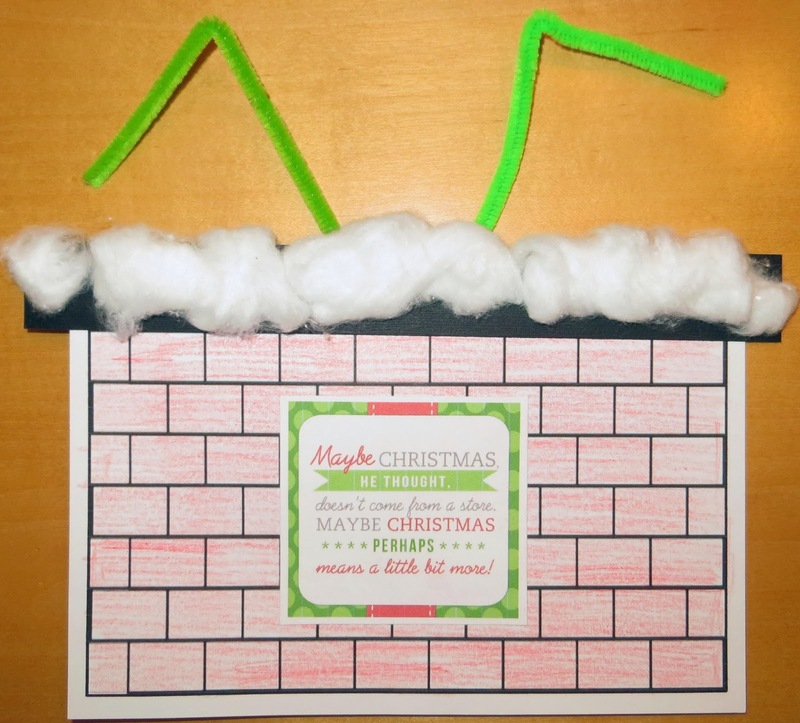 Print Grinch quote on white cardstock and cut out (from The Cooke Family blog HERE). 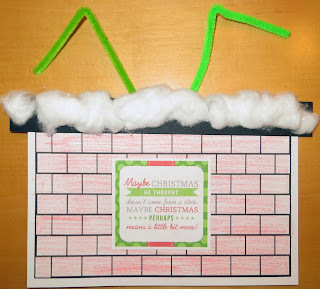 At the party, the kids colored the brick red, glued on the black strip and Grinch quote, folded pipe cleaners to look like feet and taped on the back, and then pulled cotton balls apart and glued on the black strip.